Yo Ho! Yo Ho! It's a pirate's life for me! Seriously. Ya'll think I'm joking? We don't take it to extremes like that one family on Wife Swap, but I have dedicated one room in my house to all things Pirate-y. Much to Hank's delight, it's the theme in the kid's bathroom. Ye who enter, abandon all hope. Every night at bath time, you are guaranteed to find some swashbuckling going on it in the tub. ARRGGGGHHHHHH!!!!! So, I was super happy to see a little pirate boy in the new Tiny Treats: Birthday set from Papertrey Ink being released this week. Just a month before Hank's 3rd birthday too. I jumped on that assignment like I was jumping off a plank. I always try to use my projects that I make during release week in real life. Multi-tasking. Once I got to thinking about the assignment, I thought it would be fun for my little buccaneer to wake up on his birthday and find a treasure hunt waiting for him. The clues are made with the new lunchbox note die. So easy. The numbers dies (being released as well) were a cinch to cut with just one pass through my die cut machine using some Black and White Basics paper and matted on the new Limitless Layers dies. A cute little sentiment will greet the birthday boy. On the inside, I used the journaling lines from the new Way to Go, Kiddo! and stamped my pirate boy in Hawaiian Shores ink. With help from Mom, Hank'll decipher the clues all the way around the house. The Pure Poppy and Hawaiian Shores cardstock are sure to catch his attention. And I like how he's practicing his counting while he's having fun. Where is his final stop? The pirate's cove itself, of course. I already have this decorative jar full of pirate paraphernalia in there. 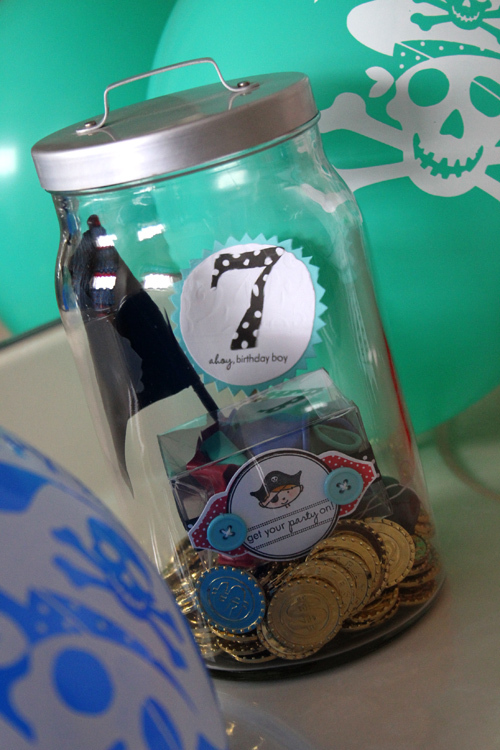 He'll be delighted to see that a fun birthday treat has appeared overnight along with his gold doubloons. As for the booty, my kid LOVES balloons. 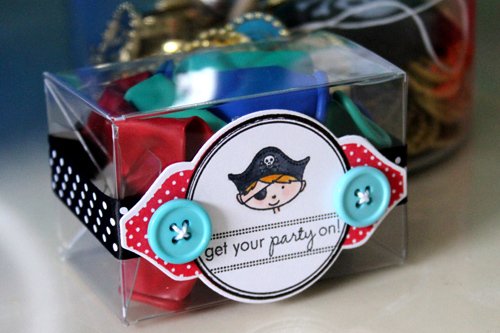 His little treat, with the saying "Get Your Party On", is six pirate balloons to be blown up. After all, it isn't a party without balloons. Ah, to be three again, and have your whole day be made with a few balloons. On the packaging, I cut Mat Stack 2 and stamped with the Mat Stack 2 Collection in Pure Poppy ink. The little pirate guy that he's been following throughout the house is finally in color, thanks to some Copics. Not coincidental that he looks like Hank. I like how the Dotted Swiss ribbon in True Black matches the paper used on the numbers. Coordination makes me deliriously happy. Off topic, but related, I though it might be fun to show a little behind the scenes of my photo shoot today. I have a little angel on my shoulder giving stamping advice. Ever wonder how I get it all done? Now you know. 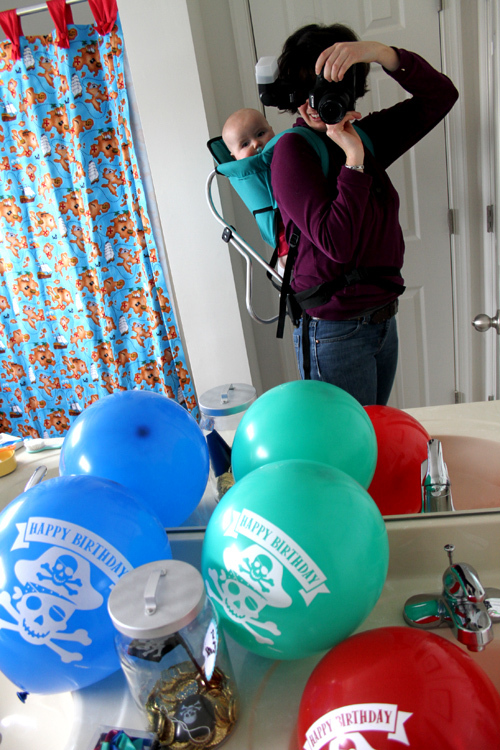 My little papoose is very happy back there. Best $5 garage sale find ever. Hope you were inspired to get some treasure of your own. Arrgggghhh! Be sure to check out the lovely creations from my esteemed colleagues. The crafty ladies will certainly have you itching to stamp. And will we be back tomorrow night with another group project? Certainly seems to be the trend, doesn't it? Thanks for stopping by. =)) love love love your idea!! Thank you for the inspiration! Marlene said: dig all the balloons. Nice going. Absolutely adorable! What a great idea...my kids would love it! And the pirate image is so cute without overdoing it. Can't wait to order this set! Thanks! So adorable, Erin! The grand finale is my favorite...both the little jar, and the photo of you in the bathroom, photographing your projects, with that little maiden on your back, hee! Treasure hunts are the best! Erin I just love your blog! You crack me up...and oh yeah you are uber talented! How super FUN!!! I wish I could go back to when my son was little and do this fun birthday with him. This totally rocks! Oh I wish I could, I think I might...he'll be 27 in March, think he'd go with it?! LOL! Awesome Erin! 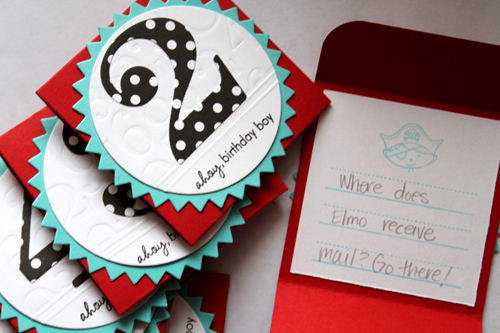 Such a wonderful idea - I can't wait to get those terrific number dies and impression plate. You are always such an inspiration! SO ADORABLE. Is that appropriate for a pirate to be adorable. So maybe it's So AARRRGGGHHH!!! Hope the Birthday boy has a fantastic birthday! 3 already???? Where does the time go? Ok, Ok!! Stop!! My sides hurt from all the laughing :) You always crack me up Erin not to mention the inspiration. I LOVE what you did here. The whole idea rocks, just like you :) Thanks Erin. What a great idea! Love the treasure hunt kit! What a fun birthday idea for your little Pirate! Great projects Erin! I often did this when my little one was small too...cooked dinner, vacuumed, stamped, all with a little one strapped on my front, back or side!! What a fun way to start a birthday, particularly for a three-year-old. Although, I think that I enjoy it, too, if gold doubloons were waiting at the end of the treasure hunt. 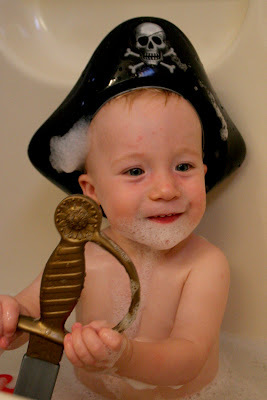 My grandson, who just turned 3, loves pirates too! Great party idea. Love those number dies too. Happy Birthday to Hank. Too freakin' cute Erin! Makes a pirate want to cry tears of happiness! Awesome job! Love that little pirate image. We had the over the top Pirate Party one year. I've been trying to convince my son he should have one again or my daughter to have a Pirate Princess party. So, so cute! 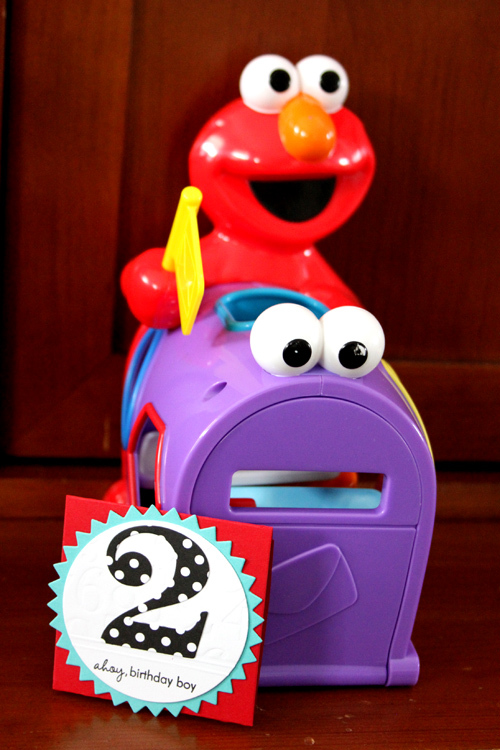 The colors and PP for the numbers are rockin - I love this idea! And that little balloon box is just too fun. He is very cute and love the pirate decouration. Fabulous! Love the behind the scene photo too.